This entry was posted in Uncategorized and tagged 1984, Aldous Huxley, Amusing Ourselves to Death, Brave New World, Harrision Bergeron, Kurt Vonnegut, problems of peace, Science Fiction, Stuart Mcmillen, the apocalypse, war. Bookmark the permalink. I’m reading BNW first time at the moment because I decided to write my graduate thesis about bodily aspects in three dystopias. Two of them you mention here, the third I suggest warmheartedly, if you haven’t already read it: Ray Bradbury’s “Fahrenheit 451”. It is about a world in which people rather socialize with telescreens (an analogy with iPads is imaginable) than with real people; and literature is forbidden and destroyed, because it supposedly makes people unhappy. 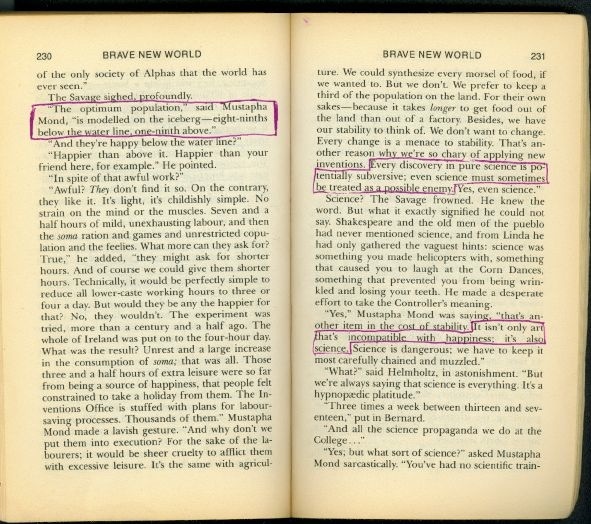 First published in 1953, it draws heavily from both Huxley and Orwell. And just as those two, Bradbury made some surprising predictions. Namely, his “mechanical hound” is becoming a reality in this decade (search “Big Dog” on youtube).